COLLEGE STATION – A newly developed fertilizer system will provide nutrition to engineered cotton crops worldwide and a deadly dose to weeds that are increasingly herbicide resistant, according to a Texas A&M AgriLife Research study. The new system applies phosphite to cotton crops engineered to express a certain gene — a gene that makes cotton able to process the phosphite into nutrition while the same compound suppresses weeds that are unable to use it, researchers said. “Our researchers here at Texas A&M AgriLife have addressed an issue that costs producers billions of dollars,” said Dr. Patrick Stover, vice chancellor of agriculture and life sciences at Texas A&M in College Station and AgriLife Research acting director. “This is an economical, environmentally safe and sustainable solution. Stover said this is an exciting and timely discovery in the movement to get ahead of the ongoing problem of weeds evolving faster than the chemicals and other methods developed to control them. “We believe the ptxD/phosphite system we have developed is one of the most promising technologies of recent times that can help solve many of the biotechnological, agricultural and environmental problems we encounter,” said Dr. Keerti Rathore, an AgriLife Research plant biotechnologist in College Station. “Selective fertilization with phosphite allows unhindered growth of cotton plants expressing the ptxD gene while suppressing weeds” is the title of a Proceedings of the National Academy of Sciences of the United States of America journal article to be released the week of June 4. The article will be found at: https://tinyurl.com/ptxDcottonphosphite. Phosphorus is a major element required by all living beings – life is not possible without it. Most organisms can only utilize phosphorus in the form of orthophosphate. “We have determined ptxD-expressing cotton plants can utilize phosphite as a sole source of phosphorus while weeds cannot, thus making it effective at suppressing weed growth,” Rathore said. The international research team led by Rathore consists of Dr. Devendra Pandeya, Dr. Madhusudhana Janga, Dr. Muthu Bagavathiannan and LeAnne Campbell, all with Texas A&M AgriLife in College Station. Others are Dr. Damar Lopez-Arredondo and Dr. Priscila Estrella-Hernandez at StelaGenomics Inc. and Dr. Luis Herrera-Estrella at the Center for Research and Advanced Studies of the National Polytechnic Institute, all in Irapuato, Mexico. This research was funded in part by Cotton Inc. Weed herbicide resistance and weed control are the No. 2 and No. 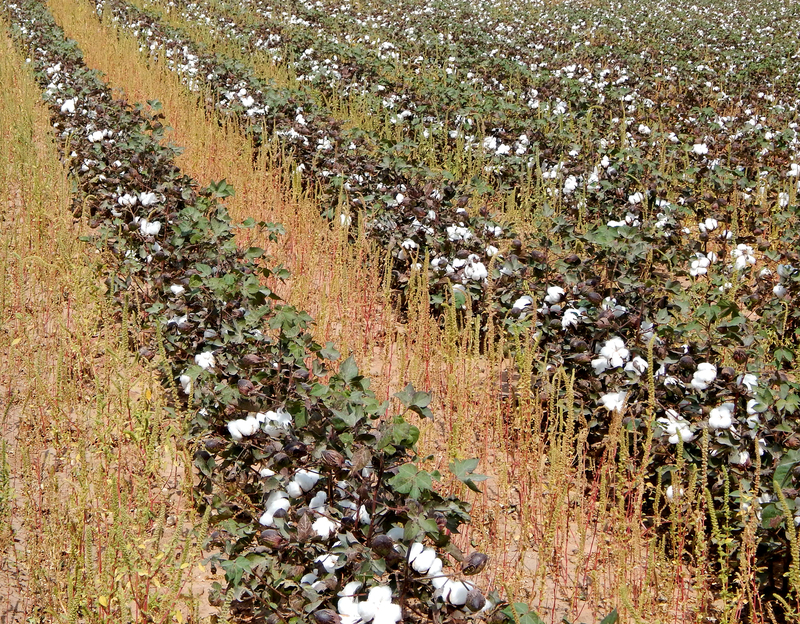 3 concerns of U.S. cotton farmers after input costs. “We can and will deliver for our cotton producers in Texas and beyond, in collaboration with Cotton Inc. and partners,” said Dr. Bill McCutchen, executive associate director of AgriLife Research in College Station. Weeds typically are managed manually, mechanically or chemically. However, he said, chemical control options are rapidly shrinking due to an increasing number of herbicide-resistant weeds in crop fields, with few alternatives on the horizon. Rathore, who has been researching genetic improvement of cotton for more than 20 years, said herbicide-resistance in weeds in not just a U.S. problem, but rather a global challenge for producers of cotton, corn and soybeans. Such a development will also relieve some of the negative perceptions associated with the use of herbicide-resistance genes and heavy dependence on herbicides, he said. Rathore has also developed cotton plants that produce very low levels of gossypol in the seeds to improve the safety and nutrition aspects of the cotton seed, but simultaneously maintain normal levels of this chemical in the foliage, floral parts, boll rind and roots for protection against insects and pathogens. He previously published a report identifying ptxD as a selectable marker gene to produce transgenic cotton plants. The ptxD gene derived from Pseudomonas stutzeri WM88 encodes an enzyme that changes phosphite into orthophosphate, a metabolizable form of phosphorus, when expressed in transgenic plants. Importantly, the ptxD/phosphite system proved highly effective in inhibiting growth of glyphosate-resistant Palmer amaranth, Rathore said. Resistance to current technologies in this highly noxious weed started showing up in fields about 10-15 years ago. “The results presented in our paper clearly demonstrate the ptxD/phosphite system can serve as a highly effective means to suppress weeds under natural, low-phosphorus soils, including those resistant to the herbicide glyphosate, while allowing better growth of the ptxD-expressing cotton plants due to lesser competition from the debilitated weeds,” Rathore said. Unlike weeds acquiring resistance to herbicides, he said it is highly unlikely weeds will gain the ability to use phosphite as a source of phosphorus. “In order for a weed to acquire the ability to utilize phosphite, one of its dehydrogenase genes will have to undergo a complex array of multiple mutations in its DNA sequence – that’s unlikely to happen by random mutations that occur in all organisms,” Rathore said. Another important point, he said, is compared to phosphate, phosphite has higher solubility and a lower tendency to bind soil components. So, if it is applied in proper formulation to prevent leaching, lower quantities can be used without sacrificing the crop yields. “Even if some phosphite ends up in streams and rivers and eventually in lakes and the sea, the algal species will be incapable of using it as a source of phosphorus, thus preventing toxic algal blooms that kill fish and other creatures in water bodies,” Herrera-Estrella said. Future studies will focus on testing ptxD-transformants in the fields that are low in phosphorus as well as evaluating the utility of phosphite as an over-the-top ‘herbicide,’ Rathore said. Also, long-term impact of the use of phosphite as a source of phosphorus on the soil microflora under field conditions needs to be investigated.